Got Questions About Porcelain Veneers in Costa Mesa? Get Answers! Healthy teeth are always your dentist’s number one priority. However, sometimes patients with healthy teeth still wish their smile looked as good as it felt. Chips and cracks that are purely cosmetic only put a damper on self-esteem, making it difficult to smile for photos or even during first impressions. For these reasons, patients are asking many questions about one of the most effective treatments for improving their smile: porcelain veneers. Here are a few of the most common questions about porcelain veneers in Costa Mesa your dentist hears. Will Veneers Look Natural Next to My Teeth? The ultra-thin sheaths of porcelain are all customized and blended to match your existing smile exactly. This way, your dentist can prevent the phenomenon known as “chicklet teeth.” To help them blend better, some patients may pursue teeth whitening treatments prior to receiving veneers. Since a minimal amount of tooth enamel is buffed down to give the veneers room for placement, treatment is considered to be permanent. That means if you want to remove your veneers, your natural teeth will need to be recovered to look normal again. 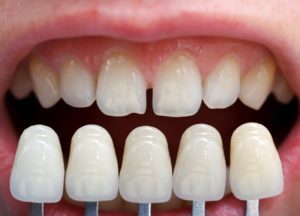 For this reason, you’ll want to make absolute sure that you want veneers and not a less invasive treatment. On average, porcelain veneers can cost between $925 and $2,500 per tooth. This can vary depending on where you receive treatment. Unlike natural tooth enamel which is very porous, porcelain is extremely stain-resistant in nature. While it is possible for them to stain, they will not stain as easily as your natural teeth. One of the reasons porcelain veneers typically come at a high cost is their high durability. On average, porcelain veneers can last between 10 and 15 years with regular care. While veneers don’t require any more care than natural teeth, you’ll need to be careful when eating certain hard foods. Chewing ice and hard candy should be avoided if you don’t want to damage your veneers. You should also discontinue poor habits like nail biting, biting pen caps, and using your teeth as a tool. Am I At Risk of Cavities or Tooth Decay? There is no additional risk to dental disease with porcelain veneers. As long as patients brush twice a day with a fluoridated toothpaste, floss daily, and visit their dentist every six months, your veneers should last for a very long time. Your dentist would never perform a treatment if he knew it would increase your chances of oral disease. Have more questions about porcelain veneers? Your cosmetic dentist in Costa Mesa would be more than happy to help. Schedule an appointment with him today! Dr. Jeremy B. Jorgenson earned his Doctor of Dental Surgery degree from the University of Southern California. He’s more than prepared to help patients conceal the smile they dislike and achieve the smile of their dreams. To learn more about his cosmetic treatments or porcelain veneers in Costa Mesa, contact him through his website. Comments Off on Got Questions About Porcelain Veneers in Costa Mesa? Get Answers!